It’s a small world! While using the museum’s Victorian Census database to research the history of a friend’s shop on Mill Street, our volunteer Ken Law found a connection to his own family! Turns out, a friend of his mother was at one time either the proprietor of a shop at that address or she lived above it! To find out more about the museum’s research facilities click here. The unusual item pictured below was recently donated to the museum. We honestly don’t know what it is! The only clue might be that it was found in a barn. The straps and neck piece (?) 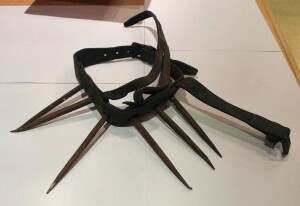 are made of leather, with six long metal spikes attached to the front. Can anyone identify what it was used for? We recently welcomed two gentlemen from Wyoming and Iowa USA with Congleton ancestry. They left a note in our visitor’s book saying: ‘Great help on research of family!’ The information we provided came from our bespoke Local Census Database. If you’d like some assistance researching your local family history, please contact the museum.